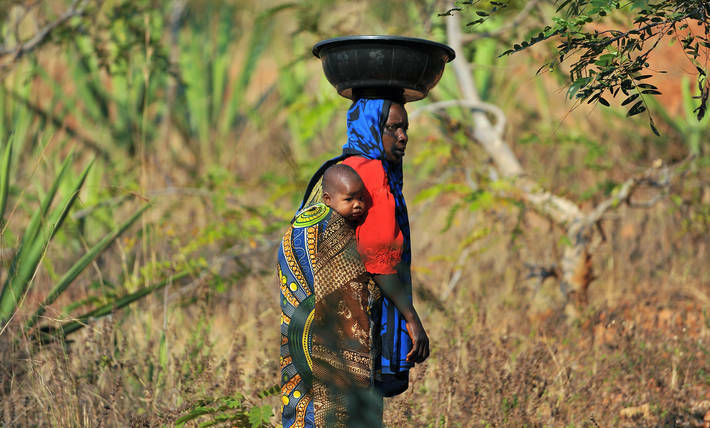 A forest-dependent mother walks through the brush with her child in Tanzania. The State of Food and Agriculture 2018 explores the links between agriculture, rural development and migration. ROME, 15 October 2018 (FAO)* – A new report on migration launched today by the UN Food and Agriculture Organization urges that policies should not stem or accelerate migration but maximize the contribution of rural migration to economic and social development while minimizing the costs. The State of Food and Agriculture 2018 states that migration must be a choice and not a necessity. Migration, agriculture and rural development policies should be coherent to ensure safe, orderly and regular migration. The report also calls for efforts in peace- and resilience-building to help communities better withstand crises and not be forced to move, and lays out actions for different country contexts. “We cannot ignore the challenges and costs associated with migration,” FAO Director-General José Graziano da Silva notes in his forward to the report. “In many situations it makes sense to facilitate migration and help prospective migrants overcome the constraints they might face, allowing them to take advantage of the opportunities that migration offers. At the same time, it also means providing attractive alternative opportunities to prospective rural migrants, not least by promoting development in rural areas or in their proximity,” Graziano da Silva adds. International migration makes the most news headlines, but the report shows that internal migration is a significantly larger phenomenon: more than 1 billion people living in developing countries have moved internally, with 80 percent of moves involving a rural area. The report shows that migration between developing countries is slightly greater than movements from developing to developed countries, and in low-income countries, internal migrants are five times more likely to migrate internationally than people who have not moved. Countries with development momentum should focus on promoting employment opportunities in agricultural value chains to provide jobs for rural communities close to where they live, according to the report’s recommendations. For countries where youth employment is a challenge, it is essential to create decent on- and off-farm employment opportunities in rural areas while also facilitating orderly migration. Other countries at an intermediate level of development should prioritize rural-urban connectivity to expand economic opportunities and reduce rural “survival” out-migration, while destination countries, including “aspirational destination” countries should address challenges posed by the poor integration of migrants. In protracted crises where people have been forced to flee, strategies that integrate humanitarian and development approaches will support self-reliance and resilience among both displaced and host communities. Rural migration will continue to be an essential element of economic and social development for both destination and origin countries, the report argues. For migrants, migration can mean higher incomes, access to better social services, and improved livelihoods, education and nutrition. Migration can improve origin countries’ development through migrants sending back remittances, and can contribute to the overall economic and social development of societies through new productive resources, skills and ideas. In many high-income countries, agriculture and rural areas are economically viable only to the extent that immigrant labour is available. But migration is not an option for the poorest of the poor who cannot afford the financial cost to migrate. Other costs can be personal: it can be disruptive for families and communities of origin, especially when the young and better educated leave. For refugees and the internally displaced, they have no choice but to move. Development often leads to more, not less, international migration, the report notes. This is despite international donors and policymakers often investing in economic development in a bid to stem migration flows. Development in low and lower-middle income countries will help incomes grow, enabling people to cover their migration costs. Development should therefore be considered as desirable in its own right, the report argues, and not merely as a means of curbing migration. However, The State of Food and Agriculture 2018 also makes the case that the types of development investment can influence people’s decisions about whether to migrate. For example, improving infrastructure and services in small cities, towns and surrounding rural areas – known as the territorial development approach – can create better links between rural communities and provide more opportunities for people to stay, rather than investments that encourage rapid urbanization. Where rural people are attracted by more prosperous conditions in urban centres, investments in rural education, health and communication can reduce migration to larger cities. The State of Food and Agriculture is an annual publication produced by FAO. The 2018 edition aims to support realistic and dispassionate debate on the issue of migration in order to put in place policy responses that address the challenges and opportunities that migration presents.